The 7I75 is a breakout card for Mesa's 25 pin I/O FPGA cards. 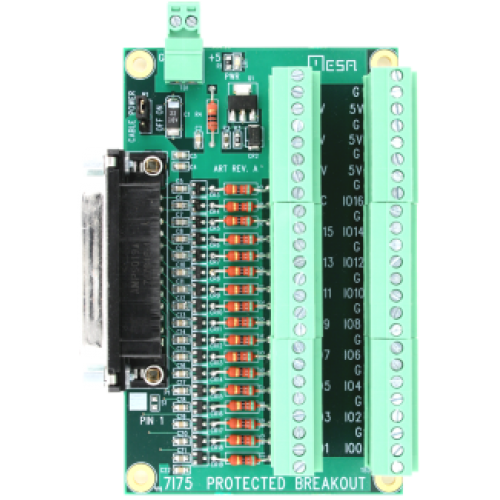 In addition to providing a breakout function, the 7I75 protects the FPGA card from excessive input voltages and ESD. 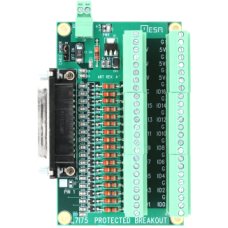 The 7I75 protects FPGA I/O from accidental contact from external voltages of +12 and -5V with built in diode clamps and 50 Ohm current limit resistors in series with all I/O pins. The 7I75 limits I/O pin bandwidth to approximately 10 MHz. Phoenix compatible 3.5 mm pluggable screw terminals are supplied with the 7I75.